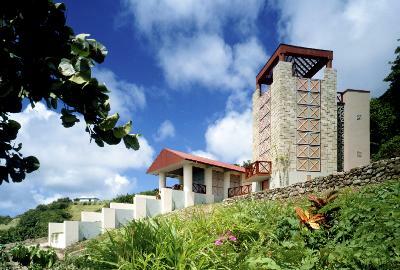 The design for a small 1,000 square foot vacation house on Nevis island, West Indies, separates the public and private functions into two distinct structures, a pavilion and a tower, connected by a service and stair wall. The pavilion is engaged to the sloping landscape by a series of cascading terraces. Rain-water is captured by gutters and pipes and is stored in a 40,000 gallon cistern under the pavilion living area.